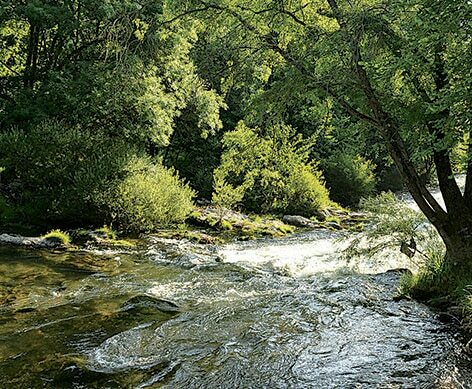 Avène, nestled in the heart of a « Hills and Springs » country, is located at the foot of the Cevennes mountains at 350 meters (1148 feet) elevation. The wonderful village of Avène lies in the bends of the Orb Valley, part of the Haut-Languedoc Natural Park between the mounts Espinousse and Escandorgue, in northern Herault. An area with a rich cultural and natural heritage. Established in 1976, the Haut-Languedoc Natural Park spreads over 260 000 hectares (642,471 acres). Two-thirds of the park are covered with woods and forests. The Park’s charter emphasizes sustainable development, economically, as much as culturally and socially. Natural habitats, biodiversity and the environment are remarkably pristine and the quality of the water is controlled on a regular basis. The water divide line (between the Mediterranean and the Atlantic ocean) flows through the Haut-Languedoc Natural Park resulting in a double climatic influence, Atlantic and Mediterranean, and an exceptional biological and environmental diversity.